We had our enclosure installed and there has not been a day where we haven't used the pool. We never realised how windy it was, and without the enclosure we would have been extremely limited in the number of days where we could use the pool. 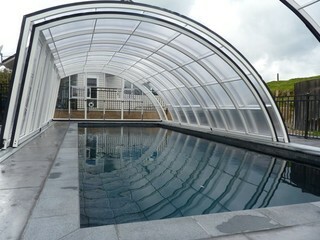 When the enclosure was first installed, within the first week the pool temperature went up by 10 degrees!!! which was fantastic as it allowed me to swim too (yes Mum is a whimp and doesn't do "cold"). During the entire process South Pacific Pool Enclosures were nothing but professional. They kept us informed during the entire process, and their workmanship has been excellent. I would recommend them and their product without hesitation to anyone with a pool. It really has allowed the entire family to be able to use the pool all year round. Thank you Roland and Wendy - we love it!!! !